Dave Naulls – Former Councillor, Wollaston Township. As a Councillor Dave Naulls has been strongly involved in recreational trails since 2007-08. A participant in many trail learning and education sessions at the provincial level, Dave has also been active on many local and regional trail initiatives. Dave has been a representative to Eastern Ontario Trails Alliance, North Hastings Economic Development, a proponent of grant applications to Ontario Trillium Foundation a member of the Hastings HOT Committee as well as being a planner and event manager for the Hilly Hundred. Most importantly, Councillor Naulls has worked to implement cooperative business and trail practices through the creation of the Bancroft, North Hastings and Eagles Nest Community Trail Committees, leading to the completion of both local events (Trailhead Hastings) and the Eagles Nest Trail. 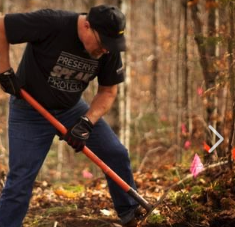 As a trail builder Dave has applied sustainable trail design and building skills in Ontario and Alberta. Recently mentored in Nova Scotia on the currently acclaimed Fundy National Park Trails.